On a psychological horror film in which the patriarchy has constructed a haunted house for one young woman to escape. “How long have we been driving for?” Renee (Isabel Shill) asks her date Jim (Collin Kelly-Sordelet) mere minutes after Carlen May-Mann’s “The Rat” starts, but clearly long enough for the college student to wonder where they’re headed in his truck. The audience is likely to have a better sense of where they’re going than Renee is after Jim says, “I wanted to do something that would get you in the mood first,” alluding to the Halloween party they’re about to attend, but no doubt thinking she’ll pick up on the double entendre. By the time they arrive at a dilapidated house in the quiet of the rural suburbs, she is in a particular mood alright, but it is now Jim who can’t understand what she’s feeling, coaxing her inside. May-Mann has fun toying with the expectations of an audience in terms of genre in “The Rat,” turning the notion of a haunted house into what women live with every day in their interactions with potentially predatory men, but she shows a laser-like focus in articulating the way in which Renee and Jim have very different expectations of the evening, depicting how his cultural conditioning and entitlement blinds him to her obvious vulnerability and instills an unreturned eagerness to please him. The writer/director makes sure to pay the attention to Renee that Jim does not, lingering on scenes when she is left alone to observe just how much she hides of herself in private moments as a means of protection and the result is chilling and deeply affecting. Shortly before the film heads to Sundance for its world premiere, May-Mann conversed via e-mail about her clever reworking of horror tropes, collaborating with Shill on such subtly devastating performance and how she scored the best ‘80s dance track you’ve never heard before for the film’s party scene. When we first spoke, you said “The Rat” was initially conceived as a proof-of-concept for a larger feature, but works quite well as a standalone short – once you decide to make a short, do the considerations of the feature go away completely and you strictly think about the story you want to tell or are there things you want to include with regards for the larger project? This short was indeed conceived as a loose proof of concept for “Strawberry Summer,” the feature that I’ve been working on for the past few years, but I wasn’t really interested in just making a distilled version of that film. Rather, I wanted to make a short that could tell its own unique story while reflecting my ethos as a director and expressing myself through the type of visual and narrative choices that I will continue to make when it comes time to make the feature. I drew heavily from “Strawberry Summer” in terms of genre, visual style, tone, and theme, but once I had written the script and gotten a feel for what it would look and feel like, I did begin to treat “The Rat” as its own entity. It was helpful for me to think within this mindset and to let the film exist in its own contained world in order to ensure that every decision I made, on set and off, was working towards the message of this film and this film alone. One of the things I was most impressed with is how you were able to show how differently Renee and Jim interpret the situation – he clearly can’t see she’s at her most vulnerable, or if he does, chooses to ignore it – but you keep it entirely in her point of view. What’s it was like to write the guy for this? You realize he has a fundamentally flawed perspective, but you don’t demonize him. It was incredibly important to me that Jim not come across as fundamentally cruel or sadistic, but still do objectively cruel and sadistic things. Something that I find so frightening about the systemic abuse perpetrated by men is that often, within their internal narratives, these men are not the villains. They can cause such disruptive, destructive pain, and never for a second think of themselves as “bad.” This truly terrifies me. Within the context of their romantic relationship, Renee has chosen to give Jim her trust, but he faces no accountability as to what he does with that trust. He holds so much social power that excuses him from having to examine his own behavior, from having to ever visualize or empathize with Renee’s perspective. His actions may not have been ill intentioned per se, but it’s so easy for someone with that sort of power to do harm and to brush it off like it’s utterly meaningless. I think that this is the sort of night that Renee will remember forever, and that Jim will soon forget. Isabel Shill is quite affecting as Renee. What sold you on her to play the lead? I was drawn to Izzy’s obvious talent when I saw her reel, and when I spoke with her for the first time on the phone, it was abundantly clear to me that she really understood what I was going for. Only having received the script a couple days prior, she was able to ask deep, probing questions about the character that got to the heart of the film. I could feel her enthusiasm for the part right off the bat, and could tell that she was excited and ready to work with me hand in hand to develop the character further. I’m so grateful to have found her, and couldn’t be more pleased with the emotive, heartbreaking performance she put in. It was incredible to see Izzy get into such a vulnerable space. Her process was really special to watch — she embodied the character in a truly thoughtful and emotionally wise way, and she added so much to the character. For example, it was her idea to have the remnants of Renee’s Halloween makeup still on her face the next morning. I was obsessed with this idea the second I heard it, and I think this little detail really added a stinging intensity to the pain of the character’s emotional hangover. Seeing her looking at herself in the mirror still gives me chills. One of my favorite things in the film is how you’ll see her when she’s alone, not putting a face on for anyone and how uncomfortable she is. What was it like to put those moments in the film? I really think that the most important moments in film are the small human ones. No matter the wild twists and turns a story takes, sometimes the perfect three second closeup can say everything that your whole film needs to say. So with this in mind, I really prioritized getting these shots while on set, and put a lot of thought into ensuring that they would shine in the cut. Editor Chris McNabb has an impeccable sense of rhythm, and really understood my instincts. I think we were able to find a great balance, letting these small moments settle in while giving them the context necessary to pack a real emotional punch and to let the subtleties of Izzy’s performance shine. As for Collin, who plays Jim, I understand he didn’t know how to drive stick shift before this. What was it like to entrust a truck driving scene to him? Intense! My producers and I had found our dream car, a 1967 Chevy Pickup, and had a moment of pure and utter panic when we realized that it was a stick shift, and that Collin had never driven stick before. But Collin volunteered to learn before the shoot, and we were lucky that he did have some resources at his disposal, including our resident stick-driver, producer Albert Tholen, on set to give pointers. As someone who has also never driven stick, I was nervous as hell, because it sounds like brain surgery to me. But Collin showed up to set and looked so confident and picturesque behind the wheel that I had to remind myself that this was new to him. I believe he told me he only stalled the car once, and never while we were rolling! What was the search like for the haunted house? It was incredibly challenging, and it took us nearly the entire duration of pre-production to find the right spot. I was waking up in the middle of the night, completely panicked, and googling “New York City Haunted Houses.” Given our small budget, we were constrained to working within the five boroughs. It seemed like it might be impossible to find a house that didn’t scream “city,” and could convey the sort of back-woods isolation that I was looking for. 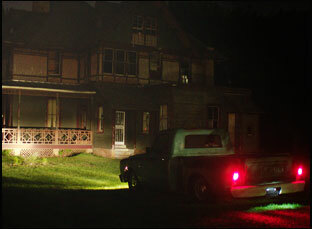 With only a few weeks to spare, however, associate producer and locations manager extraordinare Kay Sorin came across a listing for the Kreischer Mansion, so [we] schlepped deep into Staten Island on a rainy Sunday, and the moment we walked up the driveway I knew it was the perfect house, looming out of the fog like the Bates Manor. And that was before I heard the actual ghost stories! We were lucky enough to be able to shoot both interiors and exteriors at Kreischer, and the house itself was a huge inspiration to me — each room seemed to hold a surprise, from the crystal chandeliers to the slightly metallic wallpaper. If you’re in need of a haunted house for your filming needs and can handle some true creepiness, be sure to check out Kreischer! Were you able to shoot in sequence? We didn’t quite shoot in sequence, but we did shoot the scenes in the haunted house first, which I think did inform the rest of production in a significant way. Not only did we get the hardest day out of the way first, practically speaking (So many shots! Overnight! The most complicated lighting and camera set ups! ), but since the rest of the film is informed by the events that occur in the house, the cast and crew were able to bring that energy into everything else that we shot. I think that this allowed the fear of the house to really permeate the rest of the scenes in a way that’s essential to the tone of the film. Inside the haunted house, both the room with the mattress on the ground and the hallway just outside with the windows have a really interesting color scheme. What was it like figuring out a palette for this? I was actually really inspired by black and white cinematography — early horror and film noir in particular. These films really take advantage of the power of darkness in a frame, often illuminating only a single figure or a strip of wall. There’s a sense that there could be anything hiding in the shadows, and when done well, this visual elision creates a tension that permeates the entire narrative, leaving the viewer constantly on edge. It was important to the success of “The Rat” that both the viewer and the characters have a sense of the profound unknown within the house, a sense that anything might happen next. Credit goes to cinematographer Maria Rusche and her team for skillfully creating a veritable labyrinth of darkness and shadow that takes full advantage of the eerie landscape of the Kreischer Mansion and allows the characters to be literally stepping into darkness. Once they go to the party, I was utterly convinced when hearing “Best Dancer Alive” that I was hearing a Cure or Simple Minds B-side that had just been uncovered. What was it like to work with Felix Walworth a.k.a. Told Slant on that and the score in general? It’s my new favorite song! Fun story: given our relatively quick pre-production and production schedule, Felix was actually working on the score before we were even shooting, so they first sent me “Best Dancer Alive” back in July. When I first listened to the song, I was immediately obsessed, and I found that I had absolutely no notes. I sent it right to producer Beck Kitsis, who, unlike me, is actually a musician — check out her band Signal! — and she also had…no notes. Honest to God, the version you hear in the film is the first draft that Felix sent me. Not only does the song fit the vibe that I was envisioning for the scene to a T, but it went above and beyond that, adding a rich thematic and atmospheric layer to the party scene and by extension the whole film. I think that the scene came together the way it did because of the song, and it ended up being my favorite scene in the film. “The Rat” will screen at Sundance as part of Shorts Program 4 on January 25th at 6 pm at the Park Avenue Theatre in Park City, January 26th at 9:45 pm at the Broadway Centre Cinema in Salt Lake City, January 28th at 1 pm at the Redstone Cinema in Park City and February 1st at 10 pm at the Holiday Village Cinema in Park City. Sundance '19 Interview: Geoff Marslett on a Ride to Remember with "The Phantom 52"